Thirteen months after its maiden flight, SpaceX's huge Falcon Heavy rocket is being readied for its first commercial launch on Wednesday. The 230-foot-tall rocket is scheduled to lift off at 6:35 p.m. ET from the Kennedy Space Center in Cape Canaveral, Florida. This will be only the second flight for the world's most powerful rocket now in operation. The launch will be broadcast live online via SpaceX's YouTube channel. The launch was originally scheduled for Tuesday, but bad weather in Florida forced a one-day delay. The current weather forecast for the area predicts an 80 percent chance of favorable weather at launch time on Wednesday. The rocket is made up of three central boosters based on SpaceX's Falcon 9 rocket, which the company has been using to carry cargo to the International Space Station since 2012. The rocket's engines "generate more than 5 million pounds of thrust at liftoff, making it the world's most powerful operational rocket by a factor of two," SpaceX tweeted on April 7. 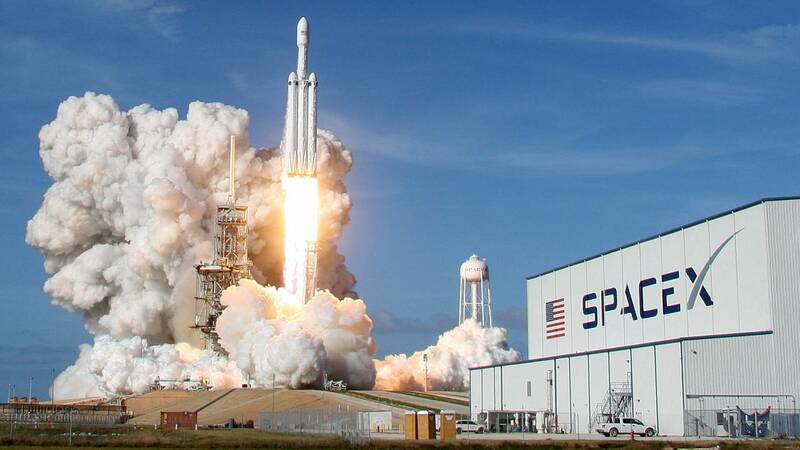 The Falcon Heavy weighs more than 3.1 million pounds and is designed to carry up to 140,000 pounds to low-Earth orbit — more than any American rocket since NASA's Saturn V, which flew Apollo astronauts to the moon in the 1960s and '70s. The Falcon Heavy made its test launch in February 2018, when it put a whimsical payload into space: a cherry-red Tesla Roadster with a spacesuit-wearing mannequin nicknamed Starman in the driver's seat. SpaceX CEO Elon Musk, who also heads up Tesla, said he had intended to put the car into orbit around Mars. But the vehicle wound up in orbit around the sun, where Musk said it could remain for "millions or billions of years."